You can't help with whom you fall in love — and that's never more annoying than when the object of your affection has royally effed up their credit. Nobody's calling it quits over a few past financial mistakes, but the situation will need to improve if you two are planning a future together that includes buying a home, starting a business, or other major money-based life decisions. Since you're now in this together, you have a responsibility to do what you can to make sure you start your joint life on the right foot credit-wise. Here's how. It's easy to throw money at a problem to make it go away — especially if you have extra cash to spare and the person you love will benefit immensely from your generosity (at least in the short term). But I urge you to avoid opening your wallet to deal with your partner's bad credit. Instead, provide encouragement that they can manage their debt on their own. They created this situation, after all, and the only acceptable solution is that they work it out without your financial assistance. Help them in other areas, like navigating their credit report, but don't shill out dough to dig them out. The only thing they'll take away from that scenario is that you'll always be the sucker who pays for their poor judgment. If your partner doesn't like the idea of auto-paying bills, maybe they could get on board with a regular money meeting where you both sit down each week or month to discuss your budget and bills and make payments in each other's presence. It's a way to keep each other accountable, build trust, and establish good money behaviors. Either of these options will make sure the bills are getting paid on time. 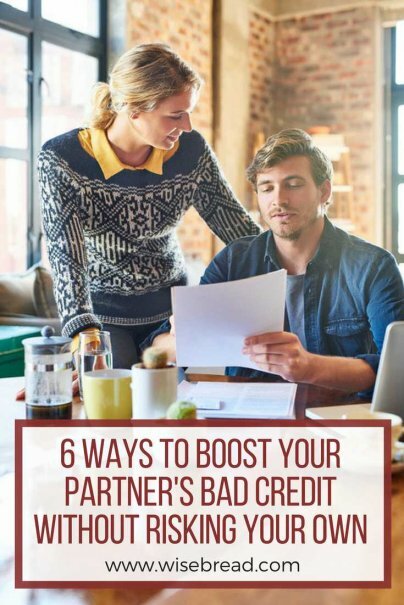 If your partner's credit score is weak, you can help improve it by encouraging them to open a secured credit card. Secured cards are fairly easy for anyone to get because the risk to the bank is low. That's because the cardholder puts down a deposit that's typically the same size as the credit limit (which will be low to begin with). If the cardholder defaults on the payments, the bank keeps their deposit. Secured cards are great for building credit because your payment activity is reported to the credit bureaus, just like any other credit card. "After demonstrating consistent payment history, your credit score will steadily improve," says certified financial adviser Lou Haverty. "You could consider applying for a regular credit card when your score is in the high 600 to low 700 range."